Today I opened my mailbox to see my favorite blue package of late (from Say it with a Sock), however, I carried it to my apartment with bittersweet emotions. On the one hand, I’ve loved every moment of receiving this subscription, but on the other, my 3 month subscription duration is over. But I digress…. *Side note: when you sign up for socks on the Say it With a Sock website, you have the option to choose “graphic socks, ” “pattern socks,” or “both”. I selected both, which is why I think I’ve gotten the full range of what you would define as “fun socks.” However, if you know that you prefer shapes and patterns over foods and animals (or vice versa), then I would definitely suggest being more selective in choosing what types of socks you’d like to receive. Overall I’m so happy I received this subscription. (Oh and full disclosure, I just emailed them to let them know I want to continue receiving socks on their “monthly” plan). Looking for great socks for Father’s Day Gifts? 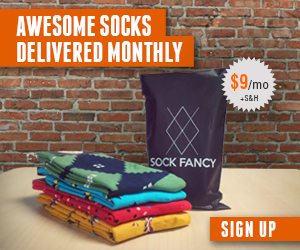 Check out our Men’s Fun Sock Subscription list!